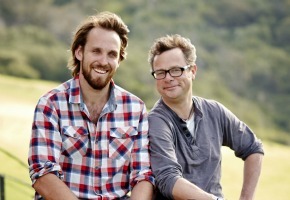 River Cottage Australia, the local adaptation of River Cottage, begins on LifeStyle Channel next month. The eight part series is hosted by former Tasmanian chef Paul West (pictured, left) but the series also begins with UK host Hugh Fearnley-Whittingstall. Fifteen years ago, Englishman Hugh Fearnley-Whittingstall, embarked on an experiment in sustainability and self-sufficiency. He moved to a cottage on a small land-holding in Dorset and set about learning how to grow his own produce, raise livestock and become part of a community where sharing not only knowledge, but the fruits of farm labour, were an important part of life. The resulting TV series, Escape to River Cottage – and more than a dozen series since – has served as an inspiration to the aspirations of viewers who want to embrace a simpler, healthier life. Far more than cooking shows, the programs have encouraged interest and debate about the importance of local and seasonal produce, and the broader issues of sustainable agriculture and fishing on a global scale. Now, Hugh Fearnley-Whittingstall is ready to take that experiment in downshifting and the message of sustainability down under, when River Cottage Australia premieres on Thursday, June 27 at 8.30pm exclusive to The LifeStyle Channel on Foxtel. In the eight-part series, Hugh will hand the River Cottage baton to an Australian counterpart – former Tasmanian chef, Paul West – who’ll face new challenges and uniquely Australian characters as he attempts to set up his own farm near the historic and picturesque village of Central Tilba on the NSW Far South Coast. The series begins with Hugh travelling to meet Paul at River Cottage Australia; a former dairy farm nestled between the pristine Sapphire Coast and the imposing Mount Gulaga – a sacred place of enormous significance for the indigenous Yuin people. Together Paul and Hugh will hear first-hand their powerful message of sustainability, as well as discover how the mountain is central to their Dreamtime stories. On the farm itself, Hugh and Paul map out a sustainable plan for the future, discover fantastic bounty as they forage locally for food and share the products of their culinary skills with the locals – who in return, will try to help them overcome the challenges of living off the land. But as the series unfolds, it’s up to Paul to make a go of it without Hugh there to guide him. He’ll learn how to dish up whatever he’s grown, reared or caught. He’ll stock the farm with chickens, pigs and cows, establish vegetable gardens, hunt for wild food, and learn the secrets of bush tucker. Can he build on the practices and passions developed at River Cottage in the UK? What new challenges will the Australian environment bring? And what will Hugh discover when he returns at the end of the series to check on his protégé’s progress? One thing is certain; the River Cottage ethos of respect and knowledge of the land and its produce won’t just put good food on the table – it’ll make great viewing as well. River Cottage Australia is co-produced exclusively for The LifeStyle Channel by ITV Studios Australia and Keo Films. Did our own Gourmet Farmer get to this idea first?